As my sisters and I were planning our annual apple-picking trip this year, I found myself more excited for the warm cider doughnuts than for plucking fresh apples off the tree. That got me thinking that I should come up with a healthier version of apple cider doughnuts that I can enjoy guilt-free all September long. Using this Apple Cider Doughnuts recipe, I made a few very easy substitutions to make the doughnuts lighter and smaller, but just as enjoyable! 2 cups sugar – I used 1 cup of sugar for the coating and 2/3 cup agave nectar for the doughnut batter for more natural sweetness. 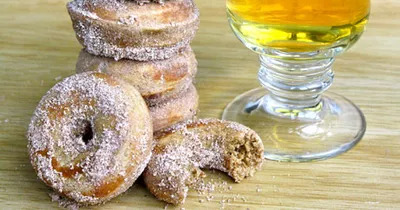 3 1/2 cups all-purpose flour – To boost the fiber content of these doughnuts, I substituted 1 1/4 cups white whole-wheat flour of the total 3 1/2 cups. 6 cups vegetable oil, for frying – I omitted this completely to seriously cut back on fat and baked the doughnuts instead in my electric mini doughnut cooker. I was quite pleased with how these doughnuts came out. They were a bit more dense and cakey than they would have been had I fried them in vegetable oil, but for a healthy alternative, they were just as flavorful and delicious.